One of the oddest albums you’re likely to hear contains the psychedelic sermons of Pastor John V. Rydgren. 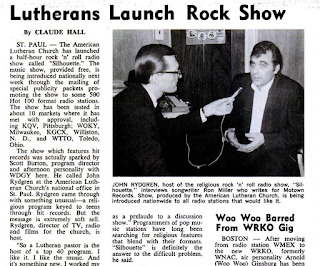 Born February 14, 1932 Rydgren – also known as Brother John - was the head of the TV, Radio and Film Department of the American Lutheran Church. He came to prominence in the mid 60s when his syndicated radio show, a half hour of rock ‘n’ roll and religion called Silhouettes, could be heard broadcast across the U.S.
An attempt to make the church seem relevant to teenagers of the day, American Armed Forces Radio picked up Silhouettes and broadcast it daily to troops in Vietnam until at least 1970. Positioning himself as a hip and trendy preacher, Rydgren wrote, announced and programmed Silhouette, taking his musical and cultural cues from the emerging psychedelic rock scene and the summer of love. Rydgren delivered his sonorous sermons over the top of current pop hits (such as Music To Watch Girls By) and treated listeners to his thoughts on spirituality and the changing times in his deep baritone voice. 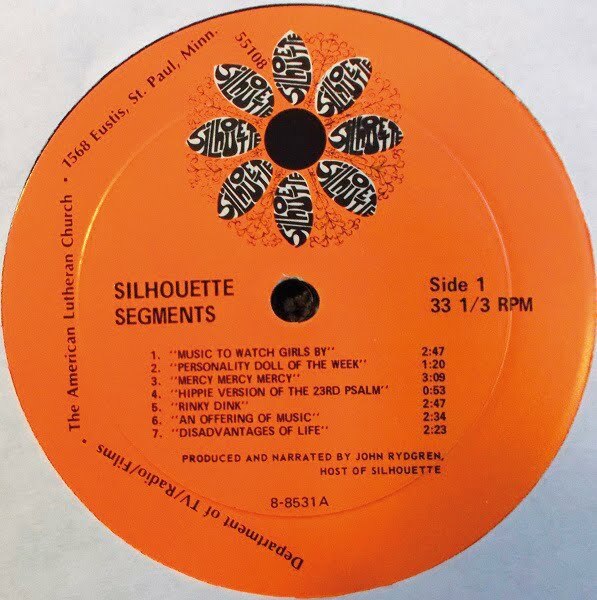 The American Lutheran Church released several LPs of his thoughts and musings – featuring a mishmash of fuzz guitars, Hammond organ, choirs, sitars and more – including Silhouette Segments (1968). 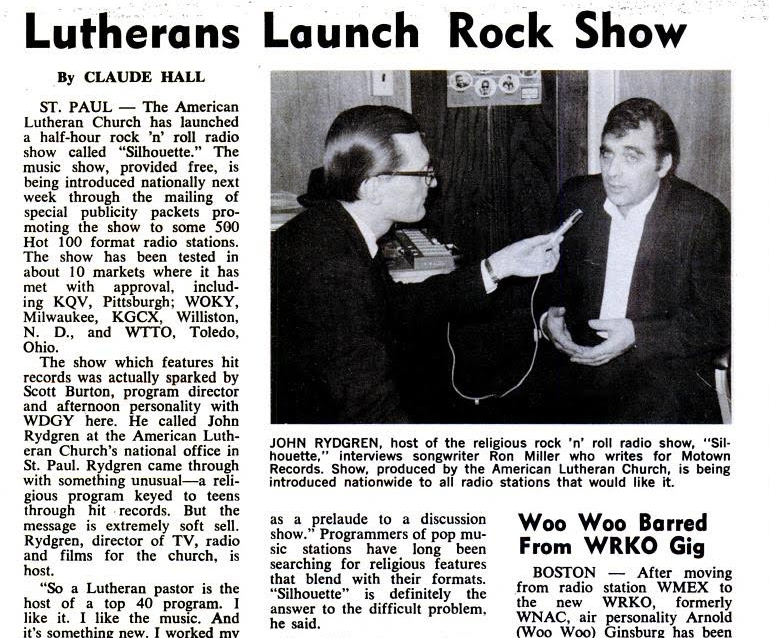 As the church saw it, Rydgren was an obvious choice as host: ‘I like music,’ he told Billboard magazine’s Claude Hall in 1967. ‘I worked my way through part of seminary at the turntables of a rock station in Columbus, Ohio. (We’re) following Christ’s pattern. He went where the action was… where the people were’. Married twice with two sons and a daughter, Brother John suffered a stroke whilst on air in 1982 and, sadly, died from a heart attack on December 26, 1988, at the age of just 56. DJ Food, who has sampled Brother John, is an avid collector and you can read more about John Rydgren and his work here. Omni Records reissued remastered versions of Rydgren's three LPs, along with bonus tracks and an additional LP, They Say, in a two-disc set in 2012. Rydgren's Silhouette segments are simply stunning, and you can find 19 of them (if you really want to) here. 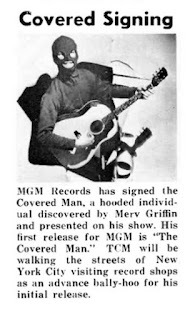 As mad as it may seem, in 1966 a man wearing a ski mask appeared on The Merv Griffin Show (a syndicated talk show started in 1965) on American TV singing a terrible song called The Covered Man. No, it wasn’t Batman or any of his on-screen villains, nor was it the mysterious masked vigilante El Kabong – no, our covered man would go on to become one half of TV detective duo Husky and Starch, and score several international hit singles in the 1970s. 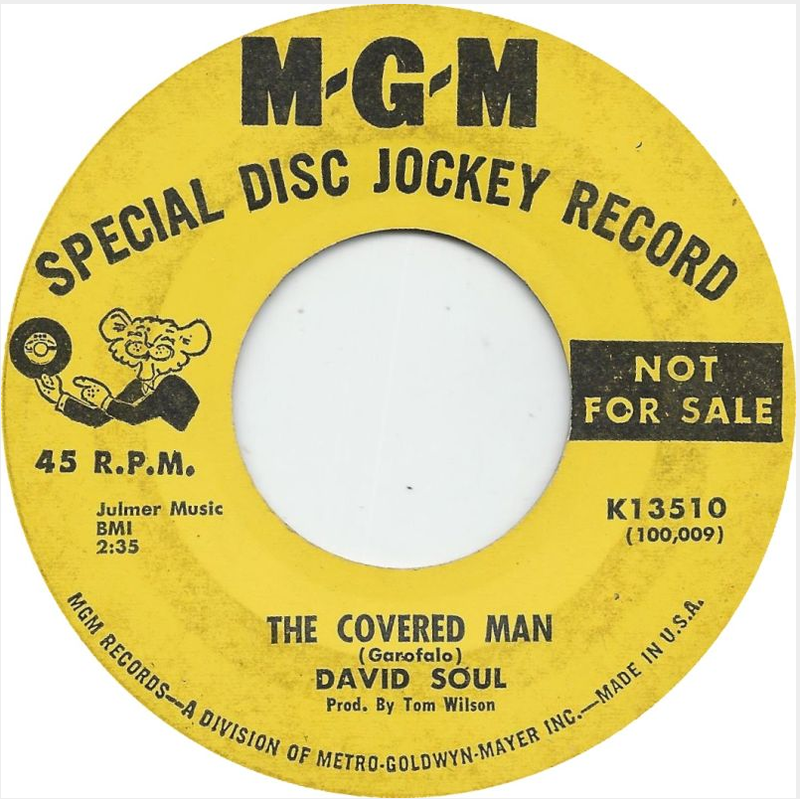 Yes, the covered man singing The Covered Man was in fact David Soul (born David Solberg in 1943). It seems it was Merv’s idea that Soul wear the ski mask, and Merv – as producer/mentor/manager of the young actor – refused to let him rake the damn thing off. The idea seems to have been that people would have been too distracted by Soul’s good looks to take him seriously as a folk singer. 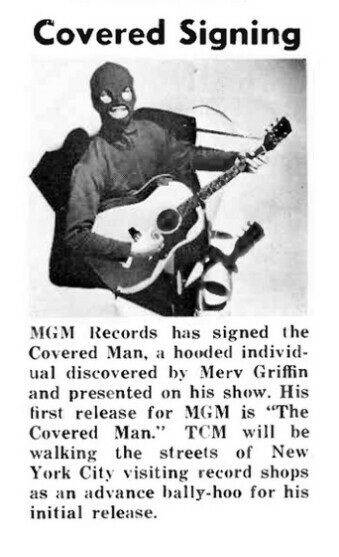 Soul made 25 appearances on the Merv Griffin Show with his balaclava in place. Poor thing. Unmasked he would go on to appear on Flipper, Star Trek and many other TV shows before landing the role that would make him famous, that of Detective Ken ‘Hutch’ Hutchinson on Starsky and Hutch, a role he played from 1975 until 1979. Now living in London with wife number five (he’s admitted in the past to having beat wife number three – Patti Carnel Sherman who was formerly married to teen idol Bobby Sherman - whilst she was seven months pregnant and while he was dealing with alcoholism), Soul is still acting and occasionally turns up on the West End stage and on TV. He starred as TV talk show host Jerry Springer (a kind of proto Jeremy Kyle for you younger readers) in the stage show Jerry Springer the Opera, which was also broadcast (amid much protest) by the BBC. 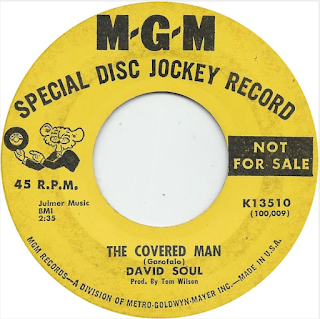 The backing band on this single (and, apparently, two more released by Soul on MGM) was the Blues Project, featuring Steve Katz who later went on to form Blood, Sweat & Tears, and Al Kooper, the famed session musician who has played with Bob Dylan (that’s him on organ on Like a Rolling Stone), Gene Pitney, the Rolling Stones The Royal Teens (he plays guitar on Short Shorts), The Who, Alice Cooper and countless others. Still, here are both sides of David’s outings as The Covered Man: The Covered Man and the Charles Aznavour song I Will Warm Your Heart. As you’ll all be very aware, for the last couple of years my life has been pretty much taken over by Florence Foster Jenkins, feted by many (including me) for the horrible quality of her singing. But opera is full of bad singers. Some, like Anna Russell, sang badly on purpose and earned quite a decent living from it. Others, like Florence, were completely sincere about her shtick... and it is here that we find the Portuguese diva Natalia de Andrade. Late in her life Madame Natalia recorded two 33rpm albums of her chronic caterwauling, murderous interpretations of works by composers such as Verdi and Puccini. The covers feature a smiling, elderly woman. Neither album is dated, but the story goes that she spent all of her money on her musical career and even borrowed to pay for her own recorded legacy... she once claimed that ‘It is only through my albums that Portugal can hear me.’ After appearing on TV in the 80s she became so famous in her home country that they would refer to Florence Foster Jenkins as ‘America’s Natalia de Andrade’. 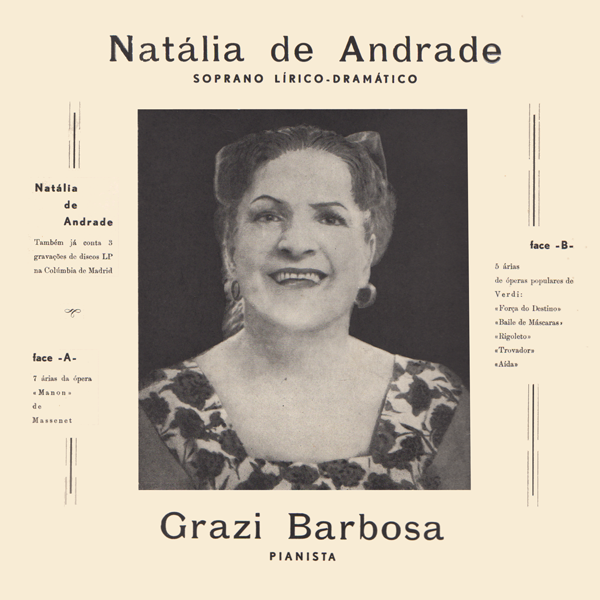 She even inspired pianist Carlos Pereira to compose a series of solos entitled Four Meditations on Natalia de Andrade, and she became the subject of a documentary Natalia, the Tragicomic Diva. 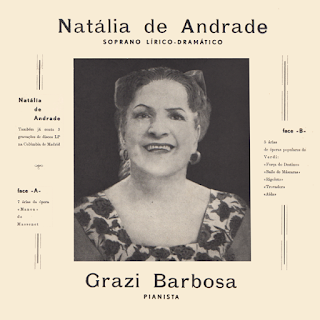 Her mother, Maria de Andrade, was a singer and gave piano lessons at home; she seems to have cultivated Natalia’s talent, accompanying her daughter in concerts from the age of 10. Later her parents enrolled her at the National Conservatory of Lisbon for voice and piano lessons. Her father worked for the newspaper O Seculo and moved in musical circles, and in 1940 Natalia appeared in the cast of an opera by composer Ruy Coelho in Lisbon Coliseum. After her father died the two women continued to live together: Natalia never married. She appears to have been a pretty mediocre student, yet somehow it seems that when she was in her mid-50s (around 1964) she was able to record an album (Colecion De Arias De Operas Portuguesas) for Columbia in Madrid (according to her diary these sessions were also self-funded) and she later recorded for Valentim de Carvalho in Lisbon. Her dairy goes in to details of how Natalia would go hungry and would pawn everything she owned (apart from her beloved piano) to pay for these sessions. Her later albums were recorded some time around 1986, when she was 76. Natalia died on 19 October 1999, in a home for the elderly, aged 89. Right up to the end she played piano almost daily, and would regale the other residents with stories of how she had once been a star. Several years after her passing my friend Gregor Benko included one of her recordings on his compilation The Muse Surmounted a collection which featured a number of deluded divas including, of course, Florence Foster Jenkins. Have a listen to her massacring a couple of classical standards and make her what you will. A quick one today (no, I’m not having a go at the Who), but a goodie no less and a timely follow up to last week’s post I Want a Lovely, Lovely Sausage and Come to Robertson’s by Silver’s People. Today I bring you the only other known recording on the Alexander Silver label, the David Kaye Sound’s Lorelei backed with Sing An Alexander Silver Song, both written by our friend Alexander Silver. What becomes obvious as soon as A-side starts is that my earlier assumption, that the lead vocalist of Silver’s People was Alex Silver himself, was wrong. Clearly the vocalist on all four tracks is one and the same, leading me to the inevitable conclusion that he is (or was) in fact David Kaye. Not that that information helps us in any way: there’s no information anywhere on who David Kaye was nor why he thought he was suited to a career in music. As with the earlier release, there is no clue as to when the disc was issued or indeed no information about the other members of the David Kaye Sound – a woefully inept female backing singer who cannot pronounce the simple phrase ‘higgledy-piggledy’ (instead constantly rendering it ‘higgledy-picklety’), plus a guitarist, bassist and drummer. Each one of them sounds about as competent as the useless musicians employed by song-poem label Tin Pan Alley in the 1970s (although, god love him, the drummer does attempt to exhibit some prowess by trying a solo on the flip side). The matrix gives nothing away either. As usual, if you have any info please do tell!